DIGITAL: I’m a former radio man, and television journalist with over 200 hours of editing and presenting under my belt. This has been mostly live tv and various videoconference broadcasts. I have also anchored a number of canned specials. These skills have been put to good use in the online world where I’ve worked as a consultant and editor on a number of start-ups. EXPERTISE – live radio and tv presentation, and conference moderation, especially for the business and technology, and telecommunications industries: When you’re trying to communicate potential complexity to a specific audience, your chosen writer, editor, presenter or moderator must possess appropriate industry and product knowledge and be able to exploit digital media to communicate your messages professionally to your key customers and prospects. The Computer Channel: Editor in charge of content for the UK’s first business television programme for the IT and telecommunications industries. As anchorman presided over 200 hours of live tv delivered by British Satellite Broadcasting to subscribers’ homes and offices via satellite. You name it, we featured it. This channel, and its series of twice-weekly news and feature programmes, was ahead of its time. It pointed the way towards IP-TV, and woke publishers and their corporate readers up to the potential of business tv for the masses. The medium would take another 10 years to develop into something really useable. Olivetti: A number of videoconference ‘specials’ from Zurich all about the company’s new computer range – the PC Pro. 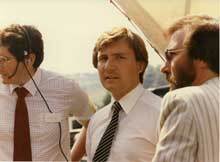 Co-presenter with News at Ten’s Pam Armstrong and broadcast to Olivetti’s dealers across Europe. Followed a news and interactive Q&A format. I also reported from the Italian Grand Prix at Imola on the launch of Olivetti’s revolutionary subportable PC, the Quaderno. Sun Life: Live Budget Analysis featuring John Major – then Chancellor of the Exchequer, later UK Prime Minister. Interviewed Sun Life’s Chief Economist in the studio who also dissected Major’s speech. Managed live phone-in from customers around the country. British Computer Society: A programme explaining BCS’ career path umbrella initiative for computing professionals – the Professional Development Scheme. Networks TV: Live presentation of the UK’s major b-b technology event of the year from Birmingham’s National Exhibition Centre. Anchored overviews of each day’s news and produced analyses. UK internetuk.internet.com: I was the site’s launch editor, and then its consulting editor when uk.internet.com was under the control of VNU Business Online. Designed and written specifically for a British audience, the site aimed to guide e-business managers through the bewildering maze of hype and techno babble that kept them away from the business of doing business on the internet. The site is now part of the huge US portal, internet.com. silicon.com: Acted as a consultant at the launch of Network Multimedia Television’s series of recorded-as-live programmes, and anchored two ‘e-commerce’ productions for the channel’s special feature – SiliconReport. It was the first in a series of in-depth looks at the hottest topics in the IT industry. We had interviews with major players, head-to-head debates, case studies and panel discussions, all of which put key business and technology issues under the microscope.